I Can't Believe Some Moron Called This Fantastic Beer "Overrated"
Hey, April: Get bent! You were no better than March, and that drizzling shitshow is the calendar’s easiest act to follow! That felt good. Now that April’s been killed, buried, and told, we can focus on more pleasant things, such as May and Russian imperial stouts, two fantastic institutions that are rarely linked, because we beer-drinkers too often let our lifestyle fantasies do our shopping for us. May is when life starts getting glorious and sunny and free after six months of misery (unless, of course, you live someplace permanently temperate, in which case: Die), which enables brewers—and the marketers and bloggers who do their bidding—to trick us into thinking we’re much more active and interesting than we really are. Now that the weather finally allows us to step outside without immediately suffering a debilitating rage-stroke, the beer-pushers are trying to flatter us into buying seasonal beers by suggesting that we’re suddenly a united nation of golfers, fishermen, rock-climbers, beer-gardeners, rib-smokers, beach-goers, and hammock-owners. Sounds great, but, I mean, have you ever seen us? I love a lot of the styles promoted as good-time, sunshine beers—pilsners, various wheats and whites, light and fruity ales—and I appreciate them all the more when I happen to find myself drinking out of doors. But I don’t even have a backyard, much less a boat or a bikini. And even the more civilized among us have to admit that regardless of the weather, beer-drinking is primarily a couch-bound pursuit, and most of our couches (and barrooms) experience roughly the same atmospheric conditions year-round. So let’s not forget about the great “winter” beers, such as North Coast’s sublime Old Rasputin Russian Imperial Stout. 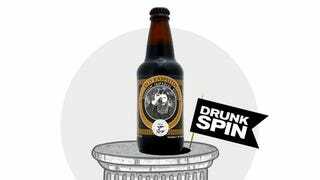 Strong stouts, many of them barrel-aged or otherwise adulterated, have become a lot of the rage over the last half-dozen or so years, but Old Rasputin has been winning prestigious international awards for nearly two decades now. This venerable wonder has been endlessly imitated but very rarely equaled, especially among its peers in pricing and accessibility. You can find 9-percent-ABV Old Rasputin year-round in 12-ounce four-packs for between $10 and $14, depending on the market. That’s a steal. Only a moron who can’t even afford sunblock would suggest otherwise. Which brings us to my shameful inclusion of Old Rasputin on last July’s “18 Overrated Beers” post. This is what I said then: “Imperial stouts from high-end breweries are similar to double IPAs in that they’re almost all very good. And Old Rasputin, from the redoubtable producer of America’s finest pilsner, is awesome. But it’s not as transcendent as its reputation suggests.” Sheesh. In retrospect, it’s clear that my heart wasn’t in the denunciation even at the time. I can’t remember what led me to include Old Rasputin on that list. Maybe I thought I needed a stout or a beer from California, or maybe I’m just a scatter-shooting, hate-spewing numbskull. If I had to bet, I’d guess I was at least subconsciously trying to even out the brand-suckling after naming North Coast’s Scrimshaw my favorite pilsner a few months earlier. But who cares: dumb move no matter what, and I’m glad I recently revisited Old Rasputin with a clearer mind and a cleaner tongue. Old Rasputin is everything you could ask for in a high-test stout. It opens with a distinct cherry-cola aroma before the expected chocolate and coffee emerge along with a light peaty note. The flavor is roasty for sure, but not so much as to overpower the dried fruit or the surprisingly piney hop character. Old Rasputin Russian Imperial Stout is rich and complex, with no one characteristic overpowering the bunch, and it is a nearly perfect beer. Anyone foolish enough to suggest otherwise should be sentenced to an eternal April.